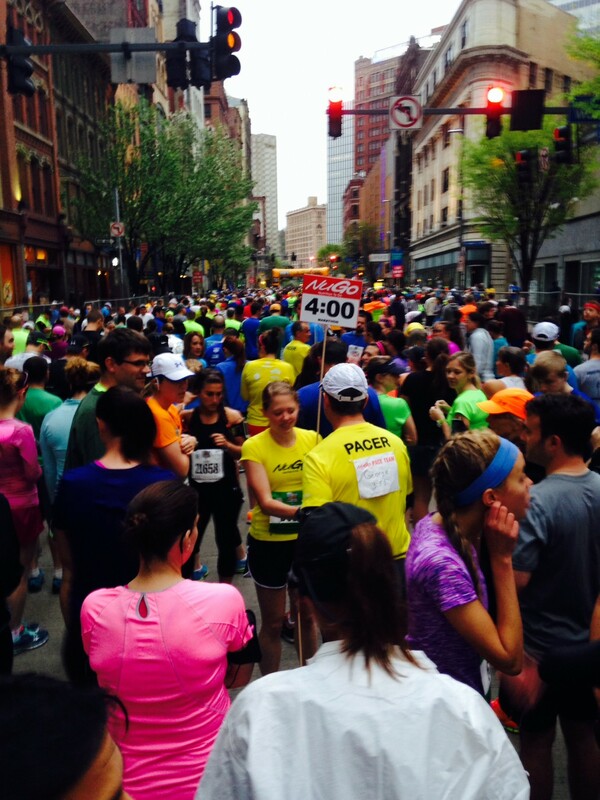 With the Pittsburgh Marathon just a week away I thought now would be a good time to talk about the course. This will be my fourth running of the marathon here in the City of Champiyinz and each year I look forward to it. For a local it is a great chance to take a long tour of our city with all the neighborhoods out showing their best. For a visitor it’s an opportunity to see just why so many of us call this home. Early May in Pittsburgh is a grab bag as far as weather. It could be 45 and rainy like it was in 2014 or it could be humid and climbing into the 70s like last year. So keep an eye on the weather report (like I need to mention that to runners!) and dress appropriately. If it will be a cold morning some throwaway clothes are a great way to stay warm at the start line. And don’t worry! These clothes aren’t thrown away. They are collected and donated so throw on an old sweatshirt and pants you can part with or head to Goodwill and pick something up. Even punching holes in a garbage bag and wearing it like a poncho will do the trick to keep you warm. We start the adventure in downtown on Liberty Avenue, ringed by skyscrapers. GPS signal is hard to get here. One way to help yourself is by turning your watch on and acquiring signal before getting into corrals. Just get a signal lock somewhere close to downtown and turn the watch back off. When it is time to run it’ll be faster to reacquire a signal. Running the first mile and a half up Liberty the crowds are tight. If you are running for a PR it can help to get into Corrals early and position yourself at the very front of your corral . If you are not running a pace fast enough to be at the front of the corral (Hint: look for pace groups around you…can you run the pace they are lining up for?) then simply line up in the next Corral back and get to the front. There is a lag between releasing each corral so take advantage of it. This lag time will mean less dodging people early on and more finding your rhythm. Leaving Liberty we spend the next mile in the Strip District with crowds of people cheering and live bands. Mile 2 marks the first water station on the course. Turning right onto the 16th Street bridge and crossing the Allegheny River brings us to mile 3. Miles 3 to 5 take us around East Ohio Street and the Allegheny Commons. There are some slight grades here. They certainly aren’t big hills, but you will notice them. Near the top of the first one you’ll find the second water station (mile 3.7-ish). Due to construction on the Andy Warhol Bridge the course does not cross back and forth over the Allegheny River as it has in the past. Instead miles 5-6 give us a running tour past PNC Park and Heinz Stadium! Not a bad trade off. Heading by Rivers Casino and we’ll soon pass the next water station and cross the Ohio River heading into the West End. In Pittsburgh, we call the bridges bridges. For a visitor from flatter locales you might call them hills. The West End Bridge is one of the more hill-like bridges on the course. The West End is a fun little stretch. There is one small hill. Small but steep on the downhill end. For such a small section of town the crowd support is strong here. Pittsburgh loves it’s sports and that love doesn’t end at football, baseball, and hockey. You are sure to feel some of our fanaticism on Marathon day! Another water stop is around mile 8. From 9 to 10 is a slight uphill approaching the Southside. Last year a guy was trying to hand out 16 ounce cans of beer to runners here. I had to laugh. Mile 9 is a little early for me to start celebrating, but his enthusiasm was admirable! Mile 10 is the flattest mile and statistically fastest mile on the entire course. The crowds are amazing in the Southside. Take in that energy and let it boost for the task ahead. For the full marathon runner’s that task is the climb into Oakland and for our Half competitors it is the final stretch back into downtown via 5th Avenue. There are two water stops in the Southside. The first just before mile 10 and the second around 10.7. I carry my own water either with a handheld or a hydration vest. Still I stop and get a cup or two from every water stop and dump it over my head. Staying cool will make the race more pleasurable and help you perform your strongest. 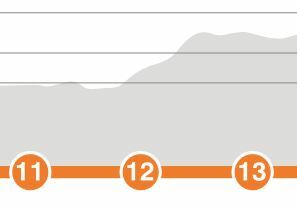 A note on pacing: The big climb on the full marathon course is between miles 12 and 13. Rather than trying to sustain a hard pace up that beast or make up time on miles afterwards I opt to run the first 12 miles 10-15 seconds faster than my goal pace. This banks up a good extra 2 minutes for the climb. This takes some of that pressure off to run the hill hard and you’ll be better served in the second half of the course by taking it easy on the climb. Miles 11 to 13.1 : Downtown or Up into Oakland? Mile 11 to 12 is spent crossing the Birmingham Bridge followed by some slight elevation on 5th Avenue. This is a different route than previous years! Early into mile 12 you’ll pass the PPG Paints Arena, home of the Pittsburgh Penguins! The last mile brings you back into downtown with a few turns and onward to claim victory! The next 1.3 miles is a whole lot of up! First it is over the Birmingham Bridge to Forbes Avenue where you’ll turn right and take on the biggest climb in the course. Play it smart and take it easy on the climb. Cage that beast for later in the race. Miles 12 to 13 pass the University of Pittsburgh Campus and the Carnegie Museum of Art and Natural History. Check out that brontosaurus statue outside the museum on your right! He is just one of hundreds. Many are around the city and many more were auctioned off to raise money for the museum. water station and a few tenths of a mile up the road one of the local churches usually sets up their own aid station as well. Mile 14 takes us through Shadyside via Walnut Street, a small street full of great shops and eateries, before climbing a small hill and once again meeting up with 5th Avenue. Mile 16 to 17 grants a reprieve in the form of flat ground and downhill through Point Breeze! Making the turn onto North Braddock Avenue and you are at the furthest point geographically from the finish line. From here to the end its the return trip! The final 9 miles! Arguably this is where the real race begins. This is where things will get difficult for many of us. Maybe its mile 17, or maybe it is mile 21 , but most of us will take a visit to the pain cave. Fortunately there is a lot of great crowd support on the return trip to boost morale. Miles 17 through 19 in Homewood have some great crowd support in a few areas. Mostly flat ground with some light rolling hills. Mile 19 leads us towards Highland Park. This mile is deceiving. It is barely perceptible, but it is uphill all the way. Then you see it. It looms closer and closer. A very perceptible hill. Fear not! Just before this beast of a climb we will swing a quick left onto Bryant Street and the Mile 20 marker! And mile 20 gives us all that uphill we just traversed in big returns , downhill returns! Slight downhill, not the quad busting kind, but the kind that is like a strong breeze at your back making your pace feel a bit easier. The half mile leading to 22 has an uphill that is slight, but at mile 22 it can feel like a monster. Take delight in knowing this is your last hill. Once cresting at the Mile 23 marker in Bloomfield it is all downhill and flat! And should you feel a bit saucy there is even some beer to be had along the way thanks to the Hashers, who set up across from Church Brew Works around mile 23.4-ish! The last 2.2 are on the long flat of Liberty Avenue. The city skyline in the distance, but never seeming to get any closer. There is no shade. There are typically no big crowds, but this year a group is throwing a little party at Mile 24! This last stretch is a mental battle as much as physical for me. However, just a mile and a half of this and you will be in the shade of downtown’s buildings on your way to claim that medal and relax at the Finisher’s Festival!